It's really full of the ambiance of old sake breweries, isn't it? Kouichiro Tsubosaka moved on to the comprehensive alcohol research lab. as breweries from times past used to. 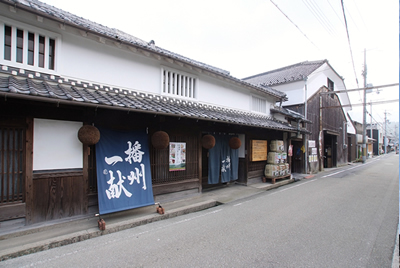 Our company was founded here in Shiso at the end of the Edo era in 1837. I am the 6th generation. This region has the pure waters of the Ibo river and rich nature. 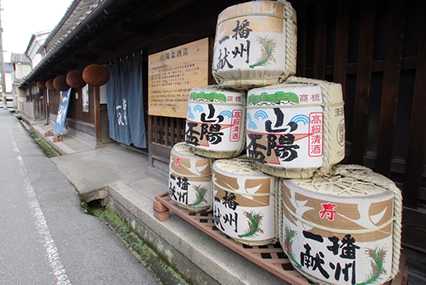 Surrounded by a grain-growing region that cultivates Yamadanishiki and other sake rices, it is the ideal climate for brewing sake. It is the former castle town of Yamazakihan, know by history buffs as the place where the great general of the Age of Provincial Wars Kanbei Kuroda was given a 10,000 stone vassalage by Hideyoshi Toyotomi. The brewery used today is the same as the one used in the Edo period. What sort of sake is your representative sake, "Banshu Ikkon"? breweries from times past used to. "Ikkon" means "Here, have a drink." In period dramas, it is used in scenes when characters say "Why don't you have a drink"? It has the idea of, "Please have some sake which has been made with effort and matured with time and which was made with the rice grown from the rich natural blessings of the Banshu region and delicious water, cherishing the real excellence of local sake." Recently clear dry sakes have become popular. There is nothing wrong with that, but our "Banshu Ikkon" strives to be a sake with the traditional taste. Shiso used to be an active lumber region, so many people worked using their muscles. I think that "Banshu Ikkonn" has come to be cherished as a sake that goes well with the heavy flavored dishes favored by those in the lumber industry. 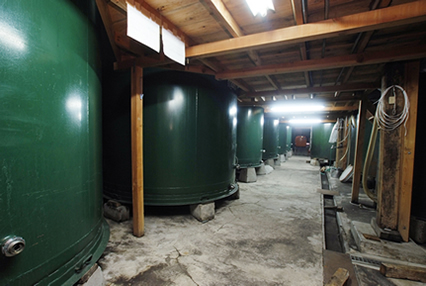 The natural "Meiju" warehouse is rare in Japan, isn't it? A brewery that has used the same mechanic since the Edo period. Finished sake is bottled in the warehouse. The bottles are then taken to Myoujugura. I think that we have the only one in the Kansai region. It is about an hour by car from our brewery, in Yabu, in the Akenobe mine which once produced tin. 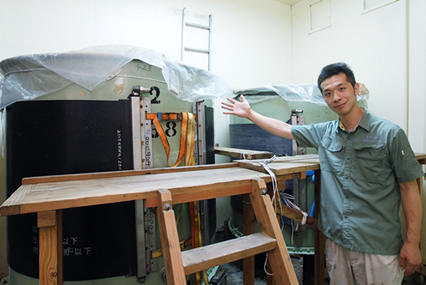 It is a natural refrigerator where the temperature is around 9 degrees all year round. It is cool in the summer, warm in the winter, and usually does not let any light in so it is pitch dark. Environments where the light is well blocked and the temperature is steady are ideal for the thorough maturation of sake. 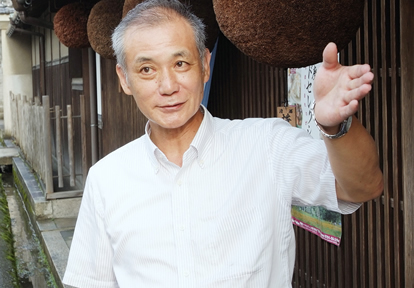 At the beginning of the Heisei period, I started to work with matured sakes, and at that time, when thinking "might there be a place that would allow for the natural long-term maturation of sake?" I thought of this place. Being allowed to use this as a warehouse required a lot of difficult procedures at the city hall, but I am very glad that we were able to make this mine warehouse. When we were first able to taste test the sake which had been matured in this warehouse, everyone was shocked at its fullness. That just goes to show how great the power of nature is. You are now putting effort into long-term maturation sakes, aren't you? head brewer is fast approaching. We used to make high-volume sake, but as the level of sake consumption slowly decreased, we began to seriously think about our sake making. As a result, we made up our minds that even if we produced a small amount, we would go in the direction of a hand-made and meticulous sake brewing. Toji Tajima has come here before, and borrowing their techniques, we have continued to create tasty local Shiso sake. To carry on the meticulous sake brewing, it is important to cherish the polishing of one's technical skills, which results in a taste only available from each particular brewery, and leads to the tasty sake that we strive for. Currently, I have entered the long-term maturation sake research association and am studying. From the clear, dry types made with malted rice, to heavy types made with pure sake and brewing, the world of long-term matured sakes is a broad one. It is an interesting sake that will continue to be the subject of attention, isn't it? Tajima master brewer was charged carefully Yamada Nishiki Banshu production, confidence with a crisp and gorgeous sake incense. Image bloom in the precincts of the shrine Otoshi in the local the "thousand years Fuji". Distinctive plump fragrance. Use Hyogo Yumenishiki. Bishu dry somewhat can enjoy the mellow taste of the rice. ・A store dealing in our SAKE:Stores click here!